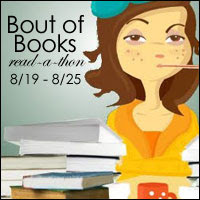 The 8th Bout of Books read-a-thon starts tonight at midnight. I had almost forgotten about it when I received a reminder notice on my cell phone. So, I need to pull together a reading (and blogging) plan for the week. The last Bout of Books that I participated in was 6.0 in January of this year. The server hosting my primary reading blog is offline, so I'm moving things here to LiveJournal for the week-long event. At this very moment, there are 435 readers who have signed up for Bout of Books 8.0, I should be #436 unless there's someone else signing up at the last minute. I'm looking forward to visiting a number of blogs to see what people are reading this week. Many of the participants will also be tweeting about their experiences, but I don't think I'll be using Twitter much this week. If you're interested in following tweets, search for or track the tag #boutofbooks.